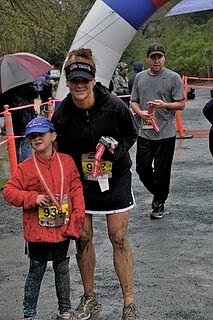 This last Saturday my sister, her husband, and their two oldest, Emma – 8 and Sophie – 6, ran a 5K trail run in the mud and rain with multiple creek crossings. Having started running recently and just finishing my 2nd 5K I can’t tell you how proud I am of Emma and Sophie! They both set personal best times, and won age division medals. I’m certain they would run circles around me. 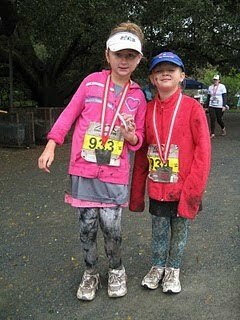 My sister and Sophie covered in mud! I echo your sentiments about your sister and her girls. Furthmore, I can't tell you how proud I am of you, Jennifer. I know how sick you have been. Very, very sick and with such a lung infection absolutely no oxygen exchange, not energy, and no stamina. Despite that, last night you got up from the sick bed to show up at your dodgeball championships, just in case you were needed. I know how close your team came to winning it all last year. Close, but lost the final championship game to a hot younger team. Well, it was a good thing you showed up because without your prescence you would have had to forfeit. Despite being ill, you played an instrumental roll with key catches to capture the title as champions. Both my daughters–stellar athletes, as well as their families. I know where they got that from. I am proud of you Jen! To presevere shows such character and intestinal fortitude. Qualities that will serve both you and your sister/and families very well.